A delight for nature lovers, the St. Johns River features exotic flora and fauna around every turn. Along with numerous places to just “get away from it all” and immerse yourself in the peace and quiet of this lazy river, there are several state parks, marinas and restaurants that are within cruising distance from our marina. Learn more about this historic river that flows north from marshes near Vero Beach all the way to the Atlantic Ocean in Jacksonville. Accessible only by boat, Hontoon Island is a paradise for fishing, camping, hiking, canoeing or kayaking, picnicking, Native American history and nature study. The largest spring on the St. Johns River, Blue Spring is the winter home of the Florida Manatee. Tour the historic Thursby house which was built at the height of the steamboat era in 1872. Enjoy picnicking in the park, canoeing or kayaking in the spring and adjoining river. The spring’s crystal clear, 73-degree water can be used by swimmers, snorkelers and certified scuba divers from mid-March to Mid-November. This beautiful area 30 miles north of Holly Bluff Marina offers a spring run that pours into Lake George, the largest of the St. Johns River Chain of Lakes. A popular boating destination and an important archaeological site, Silver Glen Springs showcases the delicate balance between recreation and conservation. 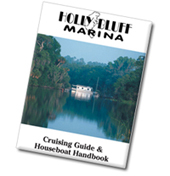 Expect a busy and festive experience on weekends and holidays as this spring is popular with local boaters. During the week it tends to be more serene. Old Florida…New Vibe. Get information on local attractions and entertainment options, family activities, lodging, dining, shopping, cultural events and much more. A nationally recognized award-winning Mainstreet community, Downtown DeLand offers excellent dining, unique shopping, cultural attractions and events. The DeLand Area Chamber of Commerce & Orange City Alliance supports the economic success of our community.